Our leather inlay guitar straps in the designer series are very unique with the variety of interesting inlay leathers and colors we offer. We hand cut interesting shapes out of the top grain tooling leather and then glue and sew a contrasting color of thinner cowhide, stingray, pigskin or goatskin under the cut out section. 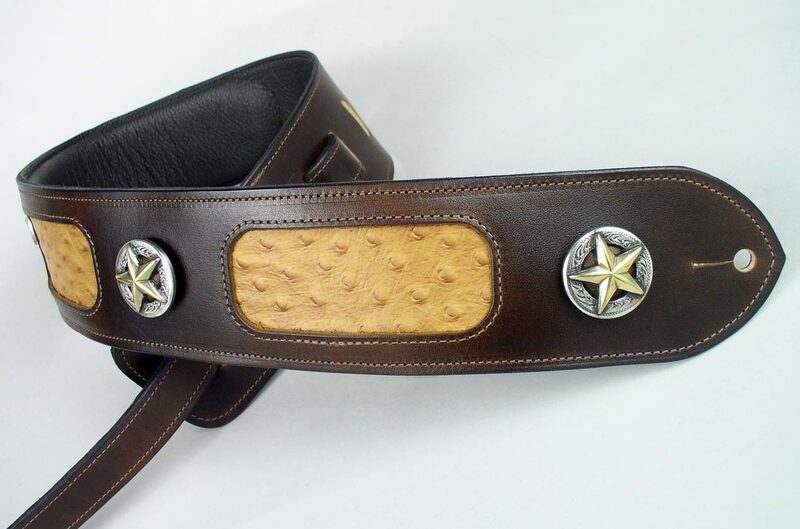 Then a soft garment cowhide lines the underneath side of the leather guitar strap. There is a choice of customizing your order into a personalized guitar strap. Personalization on these straps is subtle as we etch lettering in the narrow adjustment strap. This type of personalization is great for a gift which has meaning to the musician or for identification instead of for easy viewing by fans. We also make a praise guitar strap for Christian musicians who enjoy playing gospel music or who play with worship teams. A cross is cut out of the leather and inlayed with white leather. The word "PRAISE" is etched down the Christian guitar strap in white lettering. Since acoustic guitars are light in weight, padding is not necessary. However, if you are playing a heavy electric guitar on stage for a long period of time, you might want to choose to have us pad you guitar strap with a foam rubber padding for more comfort. As with all our custom guitar straps, we can make several longer lengths of straps for musicians that are very tall or who like to hang the guitar lower than most. Our standard leather guitar strap length adjusts from 37 inches to 52 inches. Our very long guitar straps can adjust up to 70 inches although there is not much call for these super long strap lengths. We craft a couple different lengths inbetween these lengths. However the standard length is the most popular.